West Coast metal veterans METAL CHURCH will release Classic Live via Rat Pak Records on April 28, 2017. 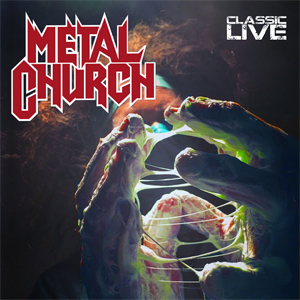 Produced by Kurdt Vanderhoof, this special edition release features nine classic METAL CHURCH songs recorded live on their 2016 tour and also includes a special bonus track; a powerful new studio version of “Fake Healer” that features a duet with QUEENSRYCHE vocalist Todd La Torre. On the subject of the “Fake Healer” duet with Todd, Mike Howe comments, “The idea came from the owner of our label Rat Pak Records (Joe). It was his idea to record this as a duet with Todd. It’s an amazing version and I think fans will be very surprised at how good it sounds!" Some very cool bundles are available from Rat Pak Records HERE.